The curved image primitive creates images that bend around the user. Curved images arranged around the camera can be pleasing for legibility since each pixel sits at the same distance from the user. They can be a better choice than angled flat planes for complex layouts because they ensure a smooth surface rather than a series of awkward seams between planes. Under the hood, a curved image is a double-sided open-ended cylinder with textures mapped to the inside of the cylinder. <a-curvedimage src="#my-image" height="3.0" radius="5.7" theta-length="72"
Ensuring that the image is not distorted by stretching requires us to carefully set the height, radius, and theta-length attributes relative to the image aspect ratio. We need to calculate r or θ for S to match the height value preserving the original aspect ratio of the image. 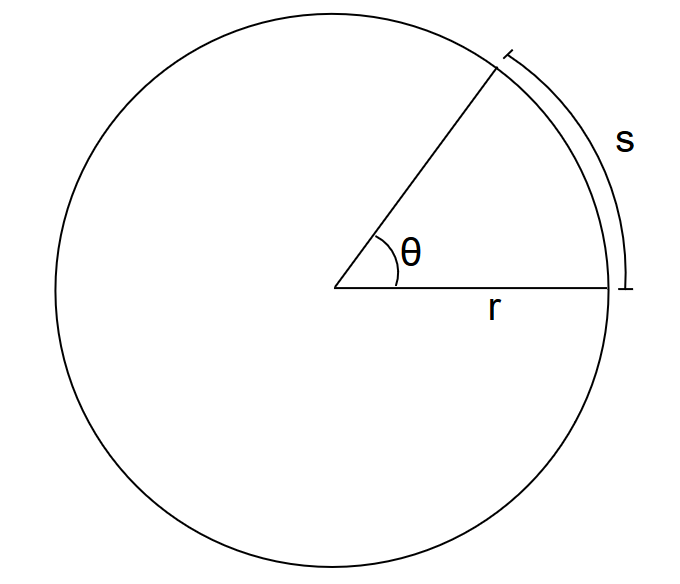 In this formula, θ is set in radians and radius and S properties are set in meters. In degrees, thetaStart defines where to start the arc and thetaLength defines where the arc ends. Once those values are fine-tuned to avoid distortion, we can use scale to safely adjust the distance of the curved image relative to the user.